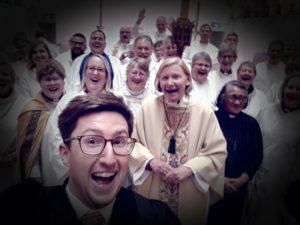 At an emotionally charged Choral Eucharist yesterday afternoon, Sunday 15 April 2018, Bishop Victoria Matthews said farewell to the Diocese after a decade of service as the eighth bishop of Christchurch. Archbishop Philip Richardson was in attendance. Following the service there were some informal ‘thank you’s and the Bishop received a pounamu pendant (from the Province) and an embroidered stole (from the Diocese). The Transitional Cathedral staff also presented Bishop Victoria with an ‘emergency kit’, consisting of a hard hat, hi-vis vest and first aid kit! Looking back on her 10 years, most people will remember the earthquakes and the cathedral debate. Not many acknowledge that she was also dealing with damage to more than 200 churches and buildings within the diocese, let alone the health and well-being issues associated with the sheer number of people whose parishes, vicarages, churches and halls were all in flux. (Christchurch Diocese is one of the three largest dioceses in New Zealand.) And few people know that the Bishop lived in a sleep-out for much of this time because her home had to be demolished. The young people in the Diocese will remember the Bishop with joy and enthusiasm. She freely confesses that some of her favourite times have been spent with the youth. A highlight she cherishes from Easter Camp each year is presiding over “midnight mass” in a tent. She will be missed next Easter. Support for social justice issues and a concern for providing excellence in theological education will also be part of her legacy. Our prayers will go with Bishop Victoria as she discerns where God is leading her. In the meantime she is going back to Canada to visit family and friends. Our prayers and blessings go with her.